Given the 350 plus Equity funds out there, which one should you invest in? Can you simply invest in one fund, which in turn will pick the Equity funds to put your hard earned money into? Yes you can – with the Quantum Equity Fund of Funds (QEFOF). QEFOF is an equity fund of funds that invests in 5-10 diversified equity schemes of third party mutual funds, shortlisted after extensive research. However, please consider the tax implication before investing as it is taxed as a Debt fund. 1. By investing in Quantum Equity Fund of Funds you don't have to worry about which equity fund you should invest in to give your money equity exposure. It will automatically invest your money in suitable diversified equity funds. 2. Our processes ensure that we rebalance our portfolio adequately, giving you what is, according to us, the suite of the finest equity funds in India. 3. Invests in not just equity but diversified equity funds that minimize the risk of investing in equities. 5. You can hold units in Demat mode too. @ shows the current value of Rs. 10,000/- invested at the beginning of a given period. What is Quantum Equity Fund of Funds or QEFOF? Fund of Funds is a mutual fund scheme investing in schemes of other mutual funds. It uses its expertise in identifying schemes and fund houses for investments. The expertise reduces the risk of wrong selection of funds. It also reduces the hassles of making multiple investments. Equity Fund of Funds will invest in equity schemes of other mutual funds. Quantum Equity Fund of Funds - QEFOF is an Open Ended Fund of Funds scheme Investing in Open Ended Diversified Equity Schemes of Mutual Funds. The fund will be investing in 5-10 diversified equity schemes of third party mutual funds. Open Ended Scheme means it is open for purchase and redemption on all business days. Investors can conveniently buy and sell units at Net Asset Value ("NAV”) based prices offering complete liquidity. • QEFOF uses intensive fundamental analysis both quantitative and qualitative for fund selection. • QEFOF monitors the portfolio regularly but not so as to engage in excessive churning. • QEFOF controls risk by keeping portfolio adequately diversified. • QEFOF gives exposure to diverse fund management styles. • QEFOF helps to invest without bias - fund house bias and star fund manager bias. What is the Investment Objective of the Quantum Equity Fund of Funds? What are the different features available under the Quantum Equity Fund of Funds? Where will the Quantum Equity Fund of Funds invest? What is the Current portfolio? Open-ended diversified equity schemes of mutual funds registered with SEBI. Quantum Equity Fund of Funds will follow a comprehensive research methodology which comprises of quantitative and qualitative analysis. Quantitative analysis: Here the focus will be on the performance of the schemes across time frames and market cycles. Qualitative analysis: The qualitative parameters will largely judge the fund on the parameters like fund house’s investment systems and processes and consistency in characteristics of its portfolio among others. Funds that emerge as the top performers on both the above parameters shall form part of the final portfolio. Click here to view the current portfolio of the Quantum Equity Fund of Funds..
What is the Benchmark of the Quantum Equity Fund of Funds & Why? The scheme was benchmarked to the S&P BSE 200 Index, however as on February 01, 2018 the benchmark of the Quantum Equity Fund of Funds has been changed to the S&P BSE 200 Total Return Index (TRI). The TRI is basically an index which takes into account all dividends / interest payments that are generated from the basket of constituents which make up the index in addition to the capital gains. The Scheme proposes to invest in underlying equity schemes, which are diversified across market-segments and sectors. A large portion of these investments will happen in diversified equity schemes ranging from large cap, mid cap to flexi cap variety. Since S&P BSE 200 TRI captures the combination of large cap and mid cap stocks along with diversification, the performance of the Scheme will be benchmarked against S&P BSE 200 TRI. Who is managing the Quantum Equity Fund of Funds? Mr. Chirag Mehta (Since November 1, 2013) is managing the scheme. What is the Minimum amount I need to invest or redeem in the Quantum Equity Fund of Funds? Please refer below table for the minimum amount required to invest or redeem in the Quantum Equity Fund of Funds. How do I invest in the Quantum Equity Fund of Funds? Who can and cannot invest in the Quantum Equity Fund of Fund? What is the current expense ratio of the Quantum Equity Fund of Funds? The expense ratio of the Direct Plan of the Quantum Equity Fund of Funds is 0.51% p.a. with effect from July 1, 2017 (Post GST). What are the entry and exit loads for the Quantum Equity Fund of Funds, why does it impose an exit load? Note: Redemptions / Switch outs of units will be done on First In First Out (FIFO) basis. The above mentioned Exit Load shall be equally applicable to the special products such as Systematic Withdrawal Plan (SWP)/ Systematic Transfer Plan (STP) and Switches etc. However, there is no load shall be charged for switching in between option / plan within the scheme. The scheme is intended for investors with a long term investment horizon. The exit load is imposed to discourage investors who may buy and sell frequently which will adversely impact the returns of the other investors. Investors who have stayed invested for at least 1 year will not be charged any exit load. Click here to read our article on "High exit loads actually work for you!" What are the different options/facilities available under the Quantum Equity Fund of Funds? Can I hold the units of under Quantum Equity Fund of Funds in Demat mode? 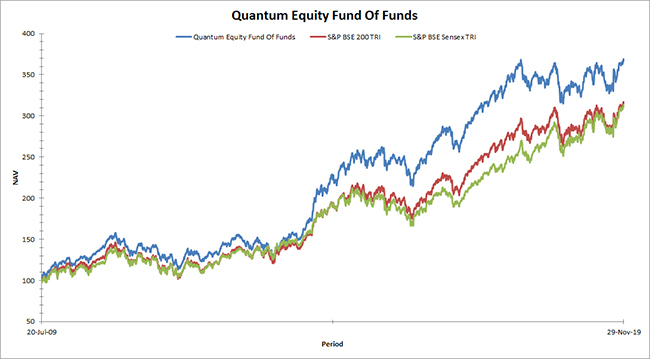 How has the Quantum Equity Fund of Funds performed? To check the performance of the Quantum Equity Fund of Funds you will have to go through the current factsheets. Tell me more about the NAV applicability and cut-off timing of the Quantum Equity Fund of Funds. NAV applicability refers to the NAV at which a transaction is affected. A cut-off time is set by the fund and all investments or redemptions are processed at that particular NAV. This NAV is relevant if the application is received before that cut-off time on a day. A different NAV holds if received thereafter. Every Mutual fund follows standard cut-off timing depending on the scheme type which is in compliance with SEBI guidelines. To know more about the NAV applicability and cut-off timings of the Quantum Equity Fund of Funds please click here. Tell me about the Tax implications if I invest in the Quantum Equity Fund of Funds.